The Nigerian Air Force on Tuesday in Abuja signed a Memorandum of Understanding (MoU) with 14 Nigerian universities and five research institutes on capacity building. Some of the universities are University of Benin, University of Ibadan, University of Lagos, Covenant University, Ota; Federal University of Technology, Minna; Obafemi Awolowo University, Ile-Ife, Ahmadu Bello University, Zaria and Yaba College of Technology. be an exception. “As a nation, we should be able to start small because we cannot continue to depend on foreign companies for aircraft spare parts, as we have to look inward. November, 2012. Odun-Ayo said the bedrock of any technological advancement was research and development, which entailed conducting investigations for producing new products and ideas. partnership through MoU’’, he said. This entry was posted in Uncategorized and tagged NIGERIAN AIR FORCE, NIGERIAN ARMED FORCES, NIGERIAN MILITARY HISTORY. Bookmark the permalink. 1) Any research MUST BE LEGALLY BINDING meaning the participants cannot taking the dividends of such research and sell it to a foreign company/ or Private manufacturer. 2) All researchers need to have CATEGORIES OF CLEARANCE yes some of them maybe as young as 22 but security is key. 3) This is inevitable as an incentive some of these RESEARCHERS upon graduation from the said universities since they will be the cream of the crop of the University should be guaranteed employment with the M.O.D. upon graduation. WHAT THE GOVT DOES NOT WANT TO DO IS TRAIN these young guys at the initial stage for another country. 5) Approximately three years ago a self EDUCATED Nigerian in his spare time built a helicopter from scratch creative people who have proved by their work that they have the capacity to help the N.A.F must be encouraged. D) A ” modern” Nigerian made communication system I say modern because the first recorded communication system is credited to the Biafrans during the Civil war. This is definitely a welcome development. I hope we are able to sustain the tempo, if not it will only end up where similar life changing projects end up in Nigeria. I have been waiting for such collaborations, extremely glad my school is part of the MoU. I sincerely hope the collaboration would include research in Cyber security, FUTMinna is currently the only Nigerian Uni running a cyber security programme and I believe it should b encouraged, as well as other institutions. Thank you for including that idea the war between nations on CYBER security has already begun ( especially between the U.S and IRAN and the U.S. and China . As Nigeria becomes more computerised it becomes more vulnerable. NTA NEWS this evening showed the NAF conducting demonstration flights of the Aerostar UAV at Kaduna today. The CAS also commissioned an innovation centre at the AFIT. We need more details on the Aerostar UAV. i know you did a piece on it way…………. back I beg refresh our memory. At a time like this, where nigeria’s economy is not at it’s best, our armed forces should poach the best and the brightest young men and women from all the land. NAF especially should scout for the best available talent to meet all their flying and technical needs. Of course step #2 would be to re equip the force, so that these bright young officers would not be bored with nothing to do. With a growing technical base, NAF and the other services can bypass the inertia of the civilian controlled ministry of defence, and make cheap acquisitions within it’s existing budget. 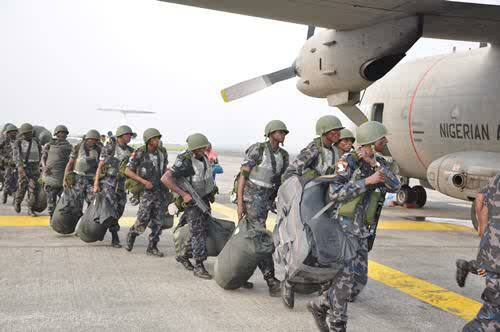 NAF would have the technical base to repair and refurbish these aircrafts. While we all await a more enlightened civilian administration, that understands that armies, airforces and navies are capital intensive investments that any serious country must make. But honestly i think the M.O.D should be reconfigured, the Office of Procurement must and MUST have only Military Personnel to plug leaks and inefficiencies. @Jimmy please if u can name this guy that built a helicopter maybe we can point them in a right directiion. Oga beeg, abeg details on the drone. We are still waiting oh. -battle field and border control. I beg to disagree,the two uav’s Amebo & Aerostar fill two requirements in the NAF,Aerostar: range 200km,endurance 12 hours,classification Medium Altitude Long Endurance uav (MALE), Amebo: range 50km,endurance 3hours,classification mini-uav.AMEBO will not be abandoned. It was an AeroStar UAV for sure, Oga Henry. I watched it from takeoff run to lift off, so we can tell what it was. As soon as details reach me, I shall splash them on these pages. The next step would be to share some of that security vote with a R&D trust fund then we send some of our old hardware from the bulldogs, bo 105 and lynx through the albatrosses and fishbeds to the jags to use as ‘speciment’ for practicals and get some sought of coop with china, india and all our other tech advanced partners and friend then give it a few years and u’ll surprised by what Nigerians will produce. Remember our sat program in partnership with UK! If the iranians can do it, why not us? Finally, we shouldn’t enter into any deal if the off set deal doesn’t include some sought of tech transfer. Army, Navy and SSS, etc I hope u’ll get on board and follow the airforce lead. Great initiative. NAF should also take a close look at the Israeli EL/M-2083 aerostat radar system,with a price tag of $20million and range 500km about 4 should be able to give sufficient radar coverage.